My 48 hours in Latvia was a last minute idea. I had been working in Greece, photographing the incredible Easter celebrations in Athens and around the country and my girlfriend at the time had gone to Latvia to spend Easter with her family. She was due back in England a couple of days after me, so I figured why not fly straight from Athens to Riga and explore the Old City which she had told me was extremely beautiful. She wasn't wrong! The perfectly preserved architecture with its narrow cobble-stone streets, not only features goregeous Medieval-era buildings, but unique sacral structures as well. The buildinrgs in the growing city were constructed by guilds of craftsmen and artists. Old Town is a striking example of how cities were built back in the day. The buildings in Old Town are varied and constructed during different periods of history. It features over 500 buildings built in various architectural styles – Romanticism, Gothic, Mannerism, Baroque, Eclectic and Modernism. The National Library of Latvia is a national cultural institution under the supervision of the Latvian Ministry of Culture was named - was opened to the public in 2014. It was designed by world-renowned Latvian-born architect Gunnar Birkerts (USA). The Nativity of Christ Cathedral, Riga, Latvia was built to a design by Nikolai Chagin and Robert Pflug in a Neo-Byzantine style between 1876 and 1883, with decorations made by the firm of August Volz, during the period when the country was part of the Russian Empire. After a long day exploring the city, what better way to relax than exploring the extensive cocktail menu at the Skyline Bar at the Radisson Blu? 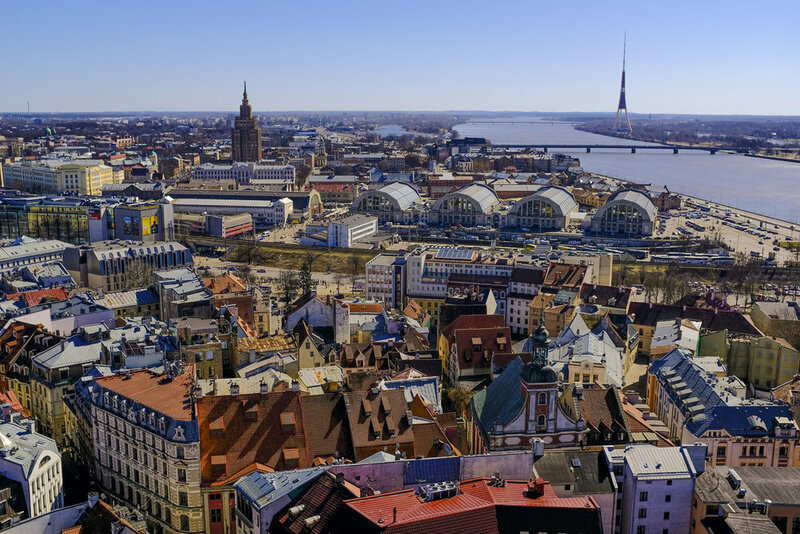 And the best part for photographers is the view of the Riga Nativity of Christ Cathedral from the glass lift as you go up! The photo of the cathedral above was taken from this vantage point. Riga is an ideal place for exploring and taking photographs and I highly recommend paying it a visit. let me know in the comments which city you would recommend I visit next!